Dassie - Amnesty International UK shop. Fair trade. Organic. Ethical. Dassie imports, retails and wholesales unique, eco-friendly homeware & gifts handcrafted by artisans in the developing world. 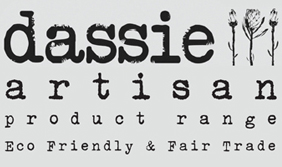 Dassie creates homeware trends while being eco-friendly & supporting fair trade. We aim to provide consumers with products that are not only decorative & functional, but products with meaning, products that carry a good ethos.